Subscribe to our mailing list for monthly newsletters and updates on new games here! This Month's New Games - Xanathar's Guide to Everything, Pandemic Legacy Season 2, Game of Thrones Catan, and more! Over twenty-five new subclasses, dozens of new spells, a collection of racial feats, a system to give your character a randomized backstory, and a variety of tools that provide Dungeon Masters fresh ways to use traps, magic items, downtime activities, and more all await within this fantastic new D&D supplement! With a story arc that unfolds over the course of a year, the game takes players on an epic journey filled with dramatic twists and shocking revelations. Initially, it is your task to keep the mainland running by providing the cities on the grid with the supplies they need to fend off the plague. But soon you must venture into the unknown, scouting areas beyond the grid. These new regions bring you closer to learning what happened to the world and how it can help you complete your objectives. They also contain new threats that alter the course of your story. As the months pass, you must adapt to each new challenge if you want any hope of saving the world. The Brothers of the Night’s Watch seek a new leader from among their ranks. Jeor Mormont wishes to promote one who can improve the infrastructure of the Gift, the bountiful and undeveloped area south of the Wall bestowed to the Watch by the Starks thousands of years ago. Drawing sustenance from the unforgiving landscape of the north offers enough challenges, but whomever takes up this task must also man and defend the Wall against the onslaught of Wildlings fighting their way into Westeros. Many brothers now compete to build, defend, and do what they can to protect Westeros, but only one shall rise above their brothers to become the new Lord Commander. But be wary—the north holds many dangers, and winter is coming. An out-of-the-box multiplayer Magic experience. Defeat your opponents as you search for the lost city. Included are four 60 card decks, 50 map tiles, and everything else you need to get started. As you explore the tile based map, you will uncover bonuses that will swing the tide of battle in your favor, or quests that offer rewards when you complete their objectives. Explore the jungles of Ixalan and conquer Orazca, the Golden City! The castle is under siege! Hordes of monsters surround the walls as they march against the citadel. Only a brave few can stand against this dire threat. Gather your wits and prepare your defense. Bastion is a cooperative strategy game that takes inspiration from extremely popular tower defense video games. Bastion subjects players to an unrelenting stream of attacks by an army of vicious monsters. By channeling the sources within the city, players work together to defend its borders, all the while gaining useful spells from the enemies they defeat. 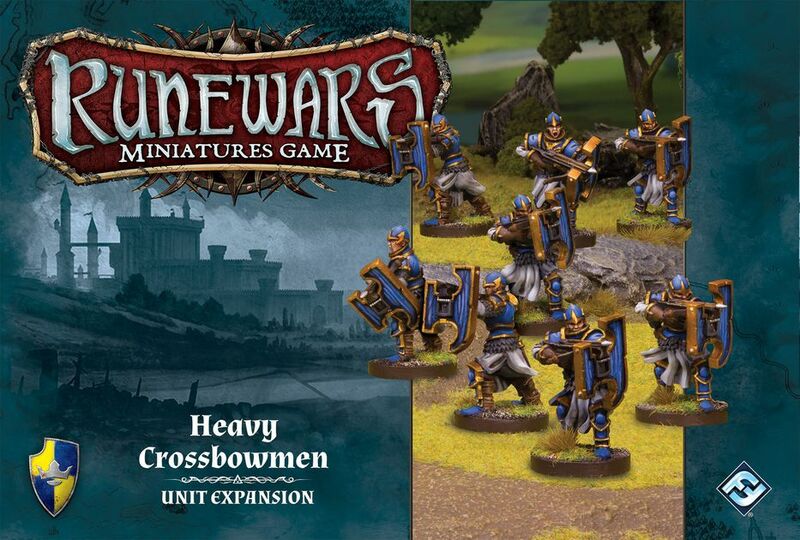 With eight Heavy Crossbowmen plastic figures and two plastic infantry movement trays, this expansion allows players to add a two-tray unit to their Daqan Lords forces in battles for Terrinoth. Expand the forces of your undead armies with four Death Knight figures and two Plastic Cavalry Movement Trays as well as five upgrade cards. The evil Lord Eradikus has all but conquered the galaxy, and is now on a victory lap across the sector in his flagship. He may rule with an iron grip, but his most prized artifacts are about to slip through his cyborg claws. You and your fellow thieves have challenged each other to sneak aboard his ship, hack your way into its command module, and steal from him. Azul was designed by the world famous, award winning game author Michael Kiesling. Azul captures the beautiful aesthetics of Moorish art in a contemporary board game. Players compete as artisans decorating the walls of the Royal Palace of Evora. By carefully drafting the correct quantity and style of tiles, the most clever of artisans plan ahead to maximize the beauty of their work (not to mention their scores!) while ensuring they wasted no supplies in the process. Heroclix: Harley Quinn and the Gotham Girls! This new set includes the biggest icons of girl power in the DC Comics Universe from classic characters like Wonder Woman to newer characters like Harley Quinn and her hyenas. HeroClix fans will get to enjoy all-new versions of Harley Quinn, DC Bombshell versions of beloved heroines, and extra-dangerous members of the Suicide Squad. Whether you’re in the streets of Gotham, outer space, or Arkham Asylum, Harley and her crew will help you bring action and mayhem to the HeroClix tabletop like never before! The Thing: Infection at Outpost 31! An alien lifeform has infiltrated a bleak and desolate Antarctic research station assimilating other organisms and then imitating them. In the hidden identity game The Thing: Infection at Outpost 31, you will relive John Carpenter’s sci-fi cult classic in a race to discover who among the team has been infected by this heinous lifeform. Play as one of 12 characters as you lead a series of investigations through the facility. The tension mounts and paranoia ensues as you question who you can trust in the ultimate race to save humanity! Rick and Morty Deck Building Game! The bad boys of animation are back in this exciting new Rick and Morty-themed deck-building game. Based on the bizarre dimension-hopping episode Close Encounters of the Rick Kind, this game goes to places the Cerberus Engine has never been. Literally. Using the same mechanics as the DC Deck Building Game (and fully compatible with it, too! ), the typical “Kick” stack has been replaced with Portal Guns, which can be used to access the unpredictable and awesome Location Deck. These Locations can be used that turn and then they go away, but you can also buy them if you think those alternate dimensions will aid your strategy. Can you take down the Council of Ricks before they get too annoying and self-righteous? Dragonfire is a 3 to 6 player deckbuilding game set within Dungeons & Dragons. Players choose from several classic fantasy races and assume one of the quintessential roles of cleric, rogue, fighter, or wizard. Equipped with weapons, spells, and magic items, players begin their adventure along the famed Sword Coast, then journey to other Forgotten Realms locales. Along the way, they can level up their characters, find additional equipment, learn new feats, and much more. Join the quest, and build your own legend! Built on the core of the award-winning Robinson Crusoe: Adventures on the Cursed Island, First Martians: Adventures on the Red Planet pits players against the hostile Martian environment and a whole host of new adventures and challenges. The immersion experience is further enhanced with an integrated app that maintains the balance and challenge throughout. Players have the option of taking on the design as a series of separate games, in a custom campaign mode in which each successive game builds on the last, or even an open world mode in which they are free to roam about the Martian surface and explore as long as they can survive. A Game of Thrones: House of Thorns! House Tyrell surges into the light with their deluxe expansion, House of Thorns! Within this box, you’ll find a wealth of new cards, bringing powerful new options to support and diversify House Tyrell’s most important themes, such as increasing the STR of their characters, removing characters from challenges, and winning challenges with the Knights and Ladies of Westeros. You’ll also find plenty of iconic characters sworn to House Tyrell entering the game, including Mace Tyrell, Brienne of Tarth, the Queen of Thorns, Margaery Tyrell, and the Knight of Flowers. Spider-Man Homecoming is set directly after the events of Captain America: Civil War in which Peter Parker tries to balance his life as an ordinary high school student in Queens with his superhero alter ego Spider-Man. Peter receives help and guidance from not only his friends and family but also his mentor Tony Stark. For the first time Legendary will step into the Marvel Cinematic Universe with Legendary: Spider-Man Homecoming! Unlock! is a series of cooperative card-based escape adventures for up to six players. Each Unlock! game consists of sixty cards depicting objects, maps, and puzzles that can be activated, solved, or combined in an effort to access other cards and areas. The free companion app tracks the time allotted to win the game, while also offering hints and unlocking new, and necessary, elements. When the players believe they have figured out the code to escape each adventure, they will input the number into the app and escape the danger, or lose even more time in finding the real sequence. Three brand-new adventures now await: The Nautilus’ Traps, The House on the Hill, and The Tonipal’s Treasure! Who’s safe when there are cannibals hiding among you? That’s the question at the heart of this fast-paced game of social deduction in which cannibals and pioneers face off in a fight for survival. Set in the winter of 1846, players are members of the ill-fated Donner Party wagon train, stranded atop a mountain with no food. Who will avoid becoming tonight’s dinner and make it off the mountain alive? And who are the suspicious scoundrels hungry for human flesh? Rowdy, outrageous, and full of playful deception, this party game packs a delightfully wicked twist! Arkham Horror LCG: Echoes of the Past! Echoes of the Past introduces a wealth of player cards driven by two major themes that allow you to refine your investigator’s practiced Talent and Composure. Cartoon Network Crossover Crisis: Animation Annihilation! Following the success of the original Crossover Crisis, more classic characters, past and present, are joining the fray! This standalone game is not only a great introduction to deck-building, but also a fantastic expansion for the original set. The new “Wonder” keyword brings a childlike sense of, well, wonder to the game as the ability allows players to play a card off the top of the main deck. You never know what you’ll get … except for a fun time and lots of surprises! Spirit Warriors takes full advantage of the latest updates to Yu-Gi-Oh! Link Monsters, the Extra Monster Zones, and strategic card placement are key elements in the Decks that can be built from the cards in this set. The Six Samurai return! You already know the story of the Six Samurai and their legendary forebears. Now, take command of the warriors that support them from the shadows every step of the way! Iconic Masters features beloved cards from throughout Magic's 25-year history, including over 20 cards with brand-new art! Iconic creatures including Angels, Sphinxes, Demons, Dragons, and Hydras are waiting to be opened in Iconic Masters booster packs. In addition, the new Duel Deck: Merfolk Vs. Goblins has hit shelves. Whether you like to master the waves or hurl goblin grenades, this Duel Deck promises a great two-player experience! Don't forget about the value-packed From the Vault: Transform, featuring three cards with brand new art! Including such classics as Delver of Secrets and Huntmaster of the Fells, this set is sure to make you flip!